A security risk assessment is an in-depth investigation to identify all the security risks on an estate. A security risk is when the estate property, and any buildings or structures provide an opportunity for a crime to occur. A security risk assessment measures whether you have taken enough precautions to remove the opportunity. It is imperative to remember that crime consists of three things: Desire, Ability and Opportunity. Opportunity is the only component that can be altered and by removing the opportunity, you ultimately remove the crime. The reason why crime is still such a tremendous problem is purely due to the fact that risk is never identified. There is no use in having the best, most expensive security equipment if it does not eliminate your risk. You will always have crime as long as the risk is still prevalent. It is also important to understand that a security risk assessment report is not a cosmetic assessment, nor is it a tick list or a ‘shopping list’. This in-depth investigation is conducted on five to seven and sometimes 10 different levels, depending on the type of property and the risks identified. A thorough assessment cannot be conducted in seven days as it takes time to establish the habits and routines of the estate and the people on the property. Many so-called assessors make use of a matrix to measure risk, however, a matrix system is used to measure probability and not opportunity. A security risk assessment measures opportunity as this is what leads to crime. One of the problems is that residents of an estate often have different ideas about what security is and, more often than not, get their security advice from someone making a living by selling security. Criminals often refer to an Estate as a ‘picnic basket’ because once they have breached either the property line or come in through the gate, they can pick and choose what they want. Scary, but true. When considering having a security risk assessment for your estate, remember that it is an assessment that should be conducted by an independent assessor who has no financial gain in recommending solutions. A security company cannot conduct a security risk assessment as they sell products and will therefore not be unbiased when recommending solutions for the risks. There is an enormous difference between a security risk assessment and a product assessment. A physical security risk assessment is also not a health and safety report. These documents are often confused and although both are vital, they are vastly different. The assessment is a document that tells you the truth about your security. It also provides you with information pertaining to the risks on and to your property, as well as recommendations on how to eliminate the identified risks. With this risk assessment report in hand, you will be in control of your security as you will be able to tell the security company what you want and not just purchase what they suggest. The solutions provided in a security risk assessment are risk-specific and unique to your property. Another reason for a security risk assessment is that it is not only focused on a crime that occurs from the outside, it also focuses on criminal elements from inside the estate. The risk assessment document provides decision makers with ample information regarding the identified risks. Having the knowledge places them in a position to spend their money on the correct solutions, therefore eliminating unnecessary purchasing of security equipment that is not risk-related. The second purpose is aimed at new owners. 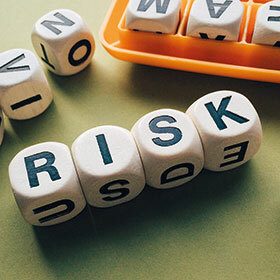 With a security risk assessment, they will know and understand what they are buying into as all the risks would have been identified and remedied or are in the process of being remedied. Remember a risk assessment is the foundation of your security structure, not only for now, but also for the future. Why is a security risk assessment necessary? We are living in the 21st century and crime has evolved, yet our methods of combatting crime have not. Security can no longer be defined as a guard and a dog. A security risk assessment is an absolute necessity as it fully identifies the security risks for an estate. This document will also get everyone on the estate to start thinking about security, to understand security, to see the risks and to speak the same security language. Once all the risks have been identified, a detailed, tailor-made security plan can be documented. This security plan is focused on eliminating the identified risks with risk-specific solutions and is designed to complement your needs as well as your unique living environment within the estate. Furthermore, a security risk assessment will put you in control of your security and it will provide you with truthful facts about your current security situation. Knowing the truth about your security puts you in a position to make the correct decisions when it comes to securing your estate. For years and years, we have been fighting a faceless person known to us as a criminal. Faceless because we don’t know what a criminal looks like – some wear tracksuits, others wear expensive clothing. Do we have the ability to differentiate between a criminal and a law-abiding citizen? A security risk assessment provides and guides you with information to focus on eliminating the opportunity for crime to be committed. Once the opportunity has been identified, you will have the knowledge and the solutions to eliminate the opportunity and thereby eliminate the criminal element. Remember that opportunity makes the thief and if there is no opportunity for a crime, the criminal will go elsewhere. Do the estate board of directors and the property owners have the combined willpower to secure the estate to a degree that is greater than the criminal’s willpower to commit a crime? In essence, the entity with the most willpower will succeed. Once a crime has been committed, it is too late to change it. Even if you arrest the criminals, you are still too late or you are still on the losing end if the victim is dead or badly injured. In the security risk assessment report, the three types of criminal mindsets are explained. It is important to understand these mindsets as it will help you with the security plan. The most common and dangerous criminal mindset is the ‘nothing-to-lose’ mindset. Believe me, the normal security hardware you purchase will not work for these types of criminals. In the security risk assessment, the estate’s body language is discussed as well as the information it provides to onlookers. It is important to understand the estates’ body language and how a criminal views the property. It is often wrongly assumed by many in the estate that security is only the responsibility of the security company when it is, in fact, each person on the estate’s responsibility. Your neighbourhood is discussed in the assessment and the importance of it is thoroughly explained. One also needs to look to the neighbourhood when it comes to security as this is where criminals come from and disappear into after a crime. The getaway is often more important than the crime itself and yet, hardly anyone pays attention to this fact. A security risk assessment highlights all these aspects of security and crime. Understanding driveway risk is imperative and is thoroughly addressed in a security risk assessment. More than 80% of crimes occur in the driveway and the biggest problem is often at the gates of an estate. Another reason why a security risk assessment is an absolute necessity is to clarify why an internal assessor cannot thoroughly assess an estate. A security risk assessment will also explain the difference between opportunity and probability. An independent security risk assessment will further highlight the importance of fighting internal crime with the same force as one would fight external crime. The benefits of a security risk assessment are numerous, and it starts with understanding crime and security. Once these concepts are fully grasped, the necessary steps can be taken to eliminate crime. With an assessment, everyone on the estate will know what the security risk is, why it is a risk as well as how to eliminate the risk. Once everyone is on the same page, they can speak with one voice. You will know the night risk-factor in the estate, what risks are found at the gates as well as at the perimeter. You will have knowledge about the different types of solutions for the risks, which security equipment will work in which area and what type of security system will be the best for your property. The estate will have better control over its security. Every piece of information in the assessment is site-specific, meaning it will be applicable to the assessed property. The security risk assessment will provide you with the knowledge to take control of what security equipment is installed and where. The assessment is a guideline to base your security upon and provides you with information on what to do when security fails. In South Africa, capturing evidence of a crime or attempted crime is a valuable and necessary aspect of security. The assessment clarifies the roles and responsibilities as well as the purpose of all the different security personnel and equipment needed to ensure that the entire security system functions as a whole. Some salespeople often take advantage of their uninformed clients to sell their products. Having a security risk assessment in hand, you will be able to clearly communicate on the same level as the salesperson, enabling you to get what you want from the security company and not be persuaded into purchasing something that is not specifically aimed at your unique risk. A security risk assessment done by an independent assessor will ensure that everyone within the estate speaks the same security language and has the same security goals. It will also allow for better budget planning as the security risk assessment document will assist in systematically implementing the suggested solutions.